Stella & Chewy's recipes were originally developed to help nourish and provide pets with a diet as close to what they would find in the wild as possible, and the results couldn't be better! 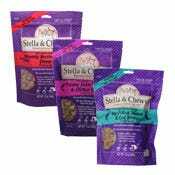 Stella & Chewy's has created a safe, convenient way to feed your pet a raw food diet. Each minimally processed recipe is produced by cold pressing at extremely low temperatures in order to preserve the original nutrients while neutralizing potentially harmful bacteria. Their high protein levels are attributed to real meats, including nutrient-dense organs and bone from sources such as grass-fed beef and lamb, wild-caught salmon, and cage-free duck and turkey. 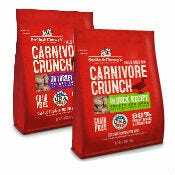 The produce they use is 100% organic produce and all recipes have excluded grains completely to make a wholesome, balanced food for dogs and cats of any breed or life stage. 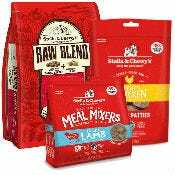 Right now, Homes Alive only offers Stella & Chewy's frozen pet foods in-store, but here you'll find a great selection of freeze-dried meal mixers and full dinners that can be used as a stand-alone diet or to supplement your cat or dog's meals with a tasty and nutritional raw boost.